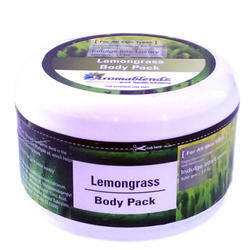 Our product range includes a wide range of aromablendz blueberry body pack, aromablendz marine algae and seaweed body pack, aromablendz lemon grass body pack, aromablendz vanilla coco body pack, aromablendz detox herbal body pack and aromablendz rich chocolate body pack. Ingredients: Coco Powder, Citric Acid, Magnesium Sulfate, Lithothamnium Calcareum, Avena Sativa Flour, Magnesium Oxide, Laminaria Digitata, Parfum & Excipients. Use & Benefits: The Algae self-heating Body Pack is formulated with micronized seaweed, well-known for their detoxifying & remineralizing properties. This very fine powder turns into an unctuous effervescent & self-heating paste when mixed with water. While the temperature gently rises, the wrap releases its marine actives. Ideal as a thalassotherapy treatment, its progressively heating effect and its natural effervescence create a genuine feeling of well-being and relieve stress. Application: 250g for a full body treatment. Mix 2 doses of powder with 3 doses of water until you get a omogeneous paste. (20 DegreeC max) Apply it quickly to the body. Wrap the customer in a plastic sheet. Do not use a warming blanket. Avoid application to wounds. Duration: 15 to 30 minutes. 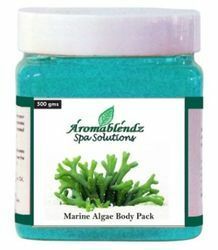 Ingredients: Spirulina powder, Laminaria powder, Marine silt powder, Marine salt, Talc. Use & Benefits: Get the goodness of whipped cream with mega moisturising that gives you a calming effect. 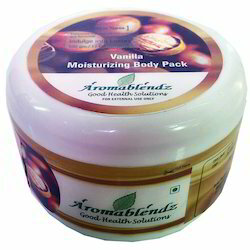 It softens and nourishes the skin giving it the blanket of satiny softness. Application: Regular application softens & nourishes the skin giving it a satin soft texture. Ingredients: Water, Vanilla extracts, Cocoa Butter, Caramel, Cocoa Powder, Allantoin, Sesame Oil, Glycerin, Vitamin E & Coconut Oil. Caution: Avoid application on cut & open skin. Regular application softens & nourishes the skin giving it a satin soft texture. Vitamin E & Coconut Oil. Caution: Avoid application on cut & open skin. Exfoliate & cleanse, exfoliate, improve collagen production & to provide relief in various skin ailments & allergies as it has antibiotic_ & anti fungal properties. For Swellings, minor cuts and surface burns: Apply about 20gms of pack mixed in water over the affected area like knees or slip disc pains by creating a moderate layer and leave about 20 min before wiping clean. 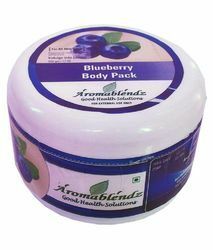 For Detoxification: Take 75 gm (2 scoops) of body pack mixed with water as a thin layer & apply starting from the face, neck, chest downwards all the way to the soles and then the back. Leave for 20 – 25min and take a bath with lukewarm water. This can be followed by a relaxing massage with AromaBlendz relaxation oil to put you off to sleep. 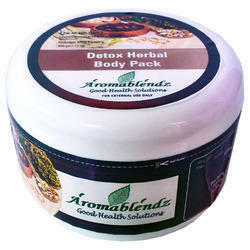 Cautions: As the pack is prepared keeping in mind the Ayurvedic principles. Strictly avoid any exposure or consumption of cold beverages or air conditioned environments for at least 5 hours after application of the pack. Uses & Benefits: Chocolate sparks off your endorphins, softens your skin, reduces wrinkles & tones the skin not to forget brightens your day. 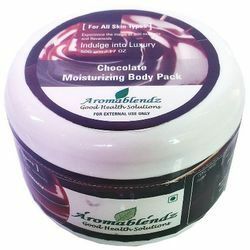 Cocoa butter contains flavonoids protect against free radicals attack and stimulate the microcirculation of the cells, resulting in increases the production of collagen and elastin. Apply evenly until it forms a thin layer. Keep for 10 to 15 minutes & wrap up in polythene cling wrap sheet. One can also use thermal blanket. Maintain the duration for 20 min, thereafter clean with warm water n sponge & shower. 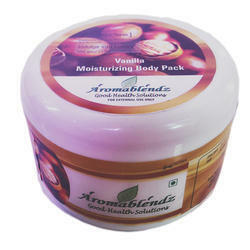 Looking for Aromablendz Body Packs ?